Patrons have played a very great part in our past in fostering Carnatic Music. Composers and musicians have been sustained, patronized & honored by both the Royals as well as the aristocratic/business magnates of the last few centuries. They were one of the essential components of the musical ecosystem of India. Given the social milieu it would be uncharitable to just say that they did this as a quid pro quo/in return for the singers/composers creating compositions in their praise. Some of these patrons themselves were musicians/composers themselves, such as King Shahaji or Maharaja Svati Tirunal. Then there were those who were lovers of music and so sustained the art and the artistes themselves such as the Rajas/Zamindars and nobles who also came to be recorded as the nayakas in the compositions such as the padas, cauka varnas etc. Well-known amongst them are the Raja of Karvetinagar, the Zamindars of Udayarpalayam and the Rulers of Ettayapuram. The Rajas, nobles and chieftains who have been sung upon include the known & the unknown. And the list of such patrons is quite a lengthy one. And one amongst them is Rajah Bhaskara Sethupati of Ramanathapuram(1868-1903) of the Royal House of Ramnad. The contribution of the Sethupathis to art & culture and to Tamil has now been almost forgotten. As Bhaskara Sethupathi’s brief life time would show us, he was a sort of a confluence of the orient and the occident. Given his education and background, he should have risen to be one of the “model” Zamindars of the British era, but it was never to be as he indulged in philanthropy so much that the coffers of his Zamin ran dry. And finally the pressure telling on him perhaps, Bhaskara Sethupathi died prematurely when he was just 35 years old. In this post, I intend to cover this great patron and analyse two compositions – a varna and a ragamalika composed in his honor by Subbarama Dikshitar. And this post is being made this month, which marks the death anniversary of this patron who died in December 1903, when he was just 35 years young. The erstwhile Southern coastal Indian Kingdom of Ramanathapuram or Ramnad had been ruled by the Sethupathis – translated to mean the ‘Overlords of the Causeway’. Tradition has it when Lord Rama, crossed over to Ceylon over the bridge built by his vAnara army, he built the temple for Lord Ramanatha as a thanksgiving upon his victory. He also appointed the first Sethupathi to protect the piligrims who would be using the causeway. Since then, they were traditionally been referred so and ruled over the “marava” country, which is the land mass between Madurai and the sea, in Southern India. They have always been till date the administrators of the Ramanathasvami temple with all hereditary rights. Famous kings of this lineage include Raghunatha Tevar or Kilavan Sethupathi (1673-1708) and Muthuramalinga Sethupathi I (1760-1794) and during the latter’s reign the Sethupatis lost their sovereignty completely to the British and ended up being a mere Zamindari, paying rent(kist/peshcush) to the British as their vassal. Bhaskara Sethupati was born on 3rd November 1868 as the first son of Raja Muthuramalinga Sethupathi II (regnal years 1862-1872) and his wife Muthathaal Nacciyar. In 1830, when Raja Ramasvami Sethupathi died without leaving behind a heir, his wife Rani Parvathavardhini Nacciar ruled the Zamindari. She was assisted by her brother Kottasami Thevar. At the end her life time, Rani Parvathavardhini Nacciar took in adoption the second son of her sister, by name Muthuramalingam who was then a minor to succeed as the Zamindar. Till his majority, his elder brother Ponnusvami Thevar ruled as his Regent. There were several legal wrangles which were witnessed during this period, challenging the adoption. Ponnusvami Tevar acting as Manager played a major political role in ensuing that his younger sibling duly became the Sethupati. And even after Muthuramalinga had attained majority, Ponnusvami Thevar (who died in 1870) continued to guide the young Muthuramalinga Sethupathy II in running the affairs of Ramanathapuram. Both the brothers were great lovers of Tamil and Music. Ponnusvami Thevar’s son was the famous Panditurai Thevar (Zamindar of Pazhavanattam, 1867-1911) who founded the 4th Tamil Sangam at Madurai. Muthuramalinga Sethupathy II was adept in the arts & in Tamil. Muthuramalinga Sethupathy II passed away suddenly in 1872 when his son Bhaskara Sethupathy was barely 4 years old. As per the then existing British administered system, the minor heir was placed under the custody of the Court of Wards till such time he attained majority. The “Court of Wards” was an instrument of control used by the British government purportedly to ensure that minor Zamindars, who were “deemed” incapable of running the Zamindari were ‘tutored’ and trained up to become model Zamindars to subserve their interest . By the late 19th century, as a policy and as a practice, the British resorted to this instrument of control very frequently when a minor became a Zamindar. The Court of Wards as an institution which functioned under the control of the Board of Revenue in Calcutta operated in every district and was headed by the district collector, an Englishman. The classic situation of when the Court of Wards would step in to administer a Zamindari was when the proprietor of the estate namely the Zamindar died leaving behind minor sons. Even in cases where a Zamindar was found unfit to run the affairs of the estate, upon the report of the District Collector, the Board of Revenue was empowered to step in to manage the estate. The Court of Wards apart from taking the responsibility of managing the estate also took charge of educating the heir apparent, the minor Zamindar. While the district collector was the nominal head, the tasks were run by a motley group of Englishmen and local learned Indians or the “natives” to put in the then English parlance. Bhaskara Sethupathi was taken to Madras to be educated both in English and in Western manners and etiquette. He had an English tutor who put him through the learning of the English classics and music as well and apparently Sir Walter Scott’s “Ivan Hoe” was one of his favorites. Bhaskara Sethupathi learned to play piano as well. To make him worldly wise, the Court of Wards made him travel to different parts of India and Ceylon as well, accompanied by his tutor. Well trained in the Western ways, Bhaskara Sethupathi did make his tutor proud as is obvious from his certification to the Court of Wards upon attainment of majority. Bhaskara Sethupathi was formally anointed by the then British Government as “Maharaja” & took over the Zamindari on 3rd April 1889. Earlier in 1888 he married Sivabhagyam Nacciar, daughter of one of his kinsmen. Bhaskara Sethupathi though western educated had his moorings in Indian culture and arts. There is a kriti in the raga Suratti which this Raja has apparently composed on Goddess Padmasini Thayar at the temple at neighboring Tiruppullani kshetra. He was devoted as a true Sethupathi, to Lord Ramanatha of Ramesvaram and to Goddess Rajarajesvari, the tutelary deity of the Sethupathis. He was so greatly enamored of Svami Vivekananda & his teachings. He funded the Svami’s historic trip to the Parliament of Religions at Chicago. Though Sethupathi was the original invitee to the Conference, he chose instead to send Svami Vivekananda and the rest is history. Svami Vivekananda too held Sethupathi in high esteem and called him a ‘Rajarishi’. And when the Svami returned back from Chicago and set foot at Pamban in Ramesvaram on Jan 26th, 1897, he was given a tumultuous welcome and to commomerate the same Bhaskara Sethupati constructed a 40ft high monument inscribed with the words ‘Satyameva Jayate’, which went on to become the motif of the Indian State some 50 years later! The congratulatory letter that Bhaskara Sethupathi wired to his illustrious contemporary Sri Jagadveera Rama Venkateshvara Ettappa ( see his profile as captured by Subbarama Dikshitar in his Vaggeyakara Caritamu) on his coronation as the Maharaja of Ettayapuram Zamindari at the end of his minority, in December 1899, is eye opening on more than one count. This Rajah of Ettayapuram too was a product of the Court of Wards and is well known in musical history as the benefactor who funded the printing & publication of Subbarama Dikshitar’s “Sangeeta Sampradaya Pradarshini” on the earnest appeal of Chinnasvami Mudaliar. And that appeal was made to the Ettayapuram King during that coronation in December 1899, which Subbarama Dikshitar refers to in his Introduction to the SSP. Some clarifications/additional information here would not be out of place. While Lord Ramanathasvami at Ramesvaram is the family deity of the Ramnad Sethupatis, Lord Subramanya at Kazhugumalai or Kazhugachalam or Kankagiri (about 22 kms from Kovilpatti in Southern Tamilnadu) is the presiding deity of the Ettayapuram Royals. The Sangita Sampradaya Pradarshini records a number of compositions created by the Ettayapuram Rajas as well by Balusvami Dikshitar and Subbarama Dikshitar on this Lord Kartikeya. We do have one kriti ‘Subramanyena Rakshitoham’ published by Kallidaikurici Sundaram Iyer, in the raga Suddha Dhanyasi attributed to Muthusvami Dikshitar, composed on this deity. An examination of Bhaskara Sethupathi and his persona would show that he in fact played two parts & with finesse – one as a loyal vassal of His Majesty’s Government and secondly as a nationalist who sympathized with the Indian National Congress. Two contradictory roles/approaches ,yet apolitical and it probably reflected his desire to remain relevant in the politics of the then Provincial Madras. The text of the letter above gives a wholesome perspective of Bhaskara Sethupati. His erudite knowledge and use of English language, his moorings in Hindu beliefs and above all his open admission as to his misjudgment in running the affairs of the Ramnad Estate & his goodwill toward Venkatesvara Ettappa stand out in his letter. SengaiyyAl vAri aLitthAyE SetupatI ! Translation: Oh Setupati, the one who gave away all, with your noble hands! Where do we now go? manniR sirundUyar pARkkara bUpathi vAzhiyavE ! A number of musicians/composers have been patronized by the Ramnad Royal House. Kundrakkudi Krishna Iyer (1816-1889), Maha Vaidyanatha Iyer (1844-1893), Patnam Subramanya Iyer (1845-1902), Poochi Srinivasa Iyengar(1860-1919) and Subbarama Dikshitar are the notable ones. In fact for Bhaskara Sethupati’s ascension to the Ramnad throne, the triumvirate of Krishna Iyer, Patnam and Maha Vaidyanatha Iyer performed together. “Nadhru dhru deem”, tillana in Sindhubhairavi composed by Pooci Srinivasa Iyengar again on Panditurai Thevar. ‘kamalAkshi ninnE koriyunnadi’ , a tana varna in Kambhoji set to jhampa tala composed by Kundrakudi Krishna Iyer on Bhaskara Sethupati’s father Muthuramalinga Sethupathi. This apart he has composed a few pada varnas as well on both Muthuramalinga Sethupati and Bhaskara Sethupati. ‘edO pArAmukam’ a Tamil svarajati in the raga Khamas composed on Bhaskara Setupati and ascribed to the Tanjore quartet descendant Sangita Kalanidhi Ponnayya Pillai. Maha Vaidyanatha Iyer, Patnam Subramanya Iyer and Kundrakkudi Krishna Iyer were a trio belonging to the same (performing) generation roughly who indulged in ‘vyavahara’ laden music, in other words indulging in complex svara and rhythmic pyrotechnics as a part of their pallavi renditions. All the three of them were recipients of honours from the Ramanathapuram Court. We do have accounts that they constantly competed actively on & off the concert stage. Interestingly we have a a unique varna from each of them in raga Kambhoji. Krishna Iyer’s aforesaid varna is in jhampa tala, a rare one. Similarly Maha Vaidyanatha Iyer’s Kambhoji creation “Pankajakshi Neepai” is littered profusely with beautiful svaraksharas. One can indeed wonder if they produced them in (friendly ?) rivalry! The reference of both Patnam Subramanya Iyer & Pooci Srinivasa Iyengar to the great Panditurai Tevar as “UgrapAndya” is hardly surprising. King Ugrapandya was the last of the Madurai/Pandyan sovereigns who had presided over the last (Third) Tamil Sangam (College of Poets). Panditurai Tevar was the key force behind the 4th Tamil Sangam which set helped set up with the participation of U Ve Svaminatha Iyer, R Raghava Iyengar, Paridhimarkalignar, Shanmugham Pillai & others. Also Panditurai Tevar’s father was a close associate of Tamil Mahavidvan Meenakshisundaram Pillai, the preceptor of U Ve Svaminatha Iyer. It was Panditurai Tevar/Ponnusvami Tevar who had apparently recommended and also sponsored Pooci Srinivasa Iyengar to learn under Patnam Subramanya Iyer. Apart from Patnam and Pooci Iyengar, Maha Vaidyanatha Iyer and his brother Ramasvami Sivan were closely associated with the Ramanathapuram Royals. We have a varna in Mohana by Harikesanallur Muthiah Bagavathar “Manamohana” in ata tala with the raja mudra of “Mudduramalinga” which Dr B M Sundaram, says as alluding to Muthuramalinga Sethupati, Bhaskara’s father. Muthuramalinga Sethupathi passed away in 1872 while Muthiah Bagavathar was born only in 1877. I am unsure how this varna can be ascribed as having been composed so. The Royal House of Ramnad also patronized a descendant of the Tanjore Quartet, Vadivelu Pillai- a grandson of the Quartet Sivanandam. by making him an AstAna vidvan. We have a beautiful Svarajati in the raga Khamas ‘ edO pArAmukam’ composed probably by this Vadivelu Pillai or by his brother’s (Kannusvami Pillai) son Sangita Kalanidhi Ponnayya Pillai (1889-1945) . 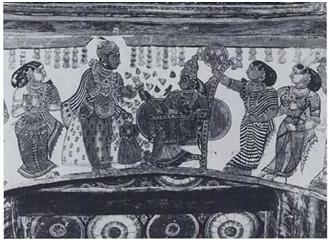 This composition in which Bhaskara Setupati is portrayed as a nAyakA is again a very rare one. The svarajathi made its way out of oblivion from the private manuscripts of the famous dance guru K P Kittappa Pillai and was subsequently published by the Music Academy. The Balahamsa varna and the navaratna ragamalika are the ones that Subbarama Dikshitar composed on Bhaskara Setupati, which find place respectively in the SSP and its Anubandha. Interestingly both have an oral tradition as well and for the present blog post I will take up these two compositions of Subbarama Dikshitar, both of them being beautiful in themselves. This apart the, composition has sahitya for the muktayisvara and the ettugada svaras apart from having an anubandha. In the text of the varna, Subbarama Dikshitar invokes the name of Lord Ramanatha of Ramesvaram, given that the Sethupathis are the considered the guardians of the mythological bridge Ramasethu that was built and are also the traditional patrons of the Ramanathasvami Temple. Subbarama Dikshitar also refers to Bhaskara Sethupathi as a recipient of the benign Grace of Goddess Rajarajesvari . One may think that its a casual mention of a Goddess from the Hindu pantheon & nothing more. A little more study of the history of the Ramnad Royals would show that She is the tutelary diety of the Sethupatis. And so it would be appropriate to digress here a bit to know more about this Goddess worshipped by the Sethupathis. U Ve Svaminatha Iyer in his chronicles records his participation in one such Navaratri celebrations on the invitation of Raja Bhaskara Sethupati. He records the gala event during which a special 1008 shankhabhisheka was performed to the Godesses. Bhaskara Sethupathy was deeply devoted to Goddess Rajarajeshvari. In his personal dairy, in an entry dating to January 1893, Bhaskara Sethupathy recorded that one of his life ambition was to completely renovate her temple. And in that year he offered a bejeweled cup and a sari weaved in gold, which he had purchased in Madras ! ¹ Apparently till then animal sacrifices were made to this deity, which was stopped by Bhaskara Sethupathi with the guidance and benign blessings of the Sankaracharya of Sringeri. 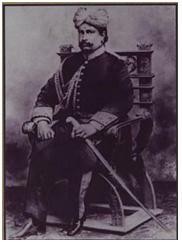 As referred earlier, Maha Vaidyanatha Iyer (1844-1893) was patronized by the Rajas of Ramanathapuram, particularly by Bhaskara Sethupathi’s father Muthuramalinga Sethupathi II (1862-1873). It is worth noting here that Vaidyanatha Iyer is never known to have a sung on a mortal. One can surmise that probably one evening, during a visit to the ‘Ramalinga Vilasam’, Vaidyanatha Iyer must have been probably invited to witness the puja of this Rajarajeshvari and he went on to compose his Janaranjani composition “pAhimAm srI rAjarAjeshvarI” in praise of the deity! Though this kriti does not have any reference in its sahitya to Ramanathapuram or its Royals, still the nexus seems worth imagining at least! And another interesting reference in this connection is the pallavi rendered by Maha Vaidyanatha Iyer during the coronation celebrations of Bhaskara Sethupati. As before mentioned, after Maha Vaidyanatha Iyer along with Patnam Subramanya Iyer and Kundrakudi Krishna Iyer finished rendering the Todi pallavi, ‘Ganalola karunalavala’, Bhaskara Sethupati requested Maha Vaidyanatha Iyer to render one more pallavi in the Simhananda tala, egged on by the assembled vidvans. The veteran composer/singer composed one in praise of Goddess Rajarajesvari, in a trice , in the 108 akshara tala and rendered it splendidly. This also leads one to another interesting trail of thought as to the circumstance in which Subbarama Dikshitar might have composed the varna on Bhaskara Sethupati. As a matter of fact apart from these compositions given in text/notation in the SSP we do not have any record of the time and place in which Subbarama Dikshitar must have met Bhaskara Sethupati. The piece could have been composed by Subbarama Dikshitar in April 1889 to commemorate the coronation of Bhaskara Sethupati when he formally became the Raja of Ramnad at the end of his minority. Also there is one other piece of information with which we can surmise/imagine another probable scenario! Bhaskara Sethupati as is obvious from his personal dairies ,was a Devi upAsakA. In the entry made in January 1893 he had indicated that he wanted to learn and practice Sakti Tantra. Indeed so in that same year the Sethupathi conducted the kumbhabishekam of the Rajarajesvari temple. And Subbarama Dikshitar perhaps met Bhaskara Sethupati on the occasion of that consecration. We well know that Subbarama Dikshitar was a practitioner of Sri Vidya cult and was initiated into it very early in life. This could have made the young & hardly 25 year old Sethupathi to look upon the sage-like looking Subbarama Dikshitar as his guru/preceptor to guide him in the worship of Devi. Let us first hear the rendering of this very rare varna by Prof S R Janakiraman and his disciple Sriram Kannan in this video clipping below recorded a few weeks ago. The Professor’s enviable repertoire traces back to two illustrious lineages as exemplified by Sangita Kalanidhi Flute Svaminatha Pillai and Tiger Varadacariar. While SSP additionally gives the sahitya for the muktayisvara and for the ettugada svaras, the same is not rendered by Prof SRJ. Attention is invited to the rendering of the concluding portions of the varna, i.e the sequential rendering of the last avarta of ettugada svara followed by the anubandha sahitya, the anupallavi, the muktayi svara and finally ending with the pallavi sahitya, which marks the logical conclusion to the rendering. This varna is a classic example of the older form of which the Bhairavi ata tala varna ‘Viribhoni’ is a prime example. Though the extant renderings of the Bhairavi varna is a truncated one, the SSP has the text & notation of the complete varna together with the anubandha. While we do have good number compositions of Tyagaraja and that of the post trinity composer Mysore Sadasiva Rao, Subbarama Dikshitar’s creation is the lexicon for this raga & contains a number of phrases which have since gone out of vogue. From a historical perspective Balahamsa finds first mention in King Shahaji’s ‘Ragalakshanamu’ followed by Tulaja’s ‘Sangita Saramruta’. Subbarama Dikshitar’s interpretation is completely aligned to the older version as given by Shahaji, with vakra murccanas. Barring a sequential SRGM and PDNs, other prayogas abound, to put it simply. Upanga and sampurna with nishada being varjya in the arohana, under the Kedaragaula raaganga. Rishabha is the jiva and nyasa svara and sadja is graha svara. It needs to be noted that the contemporaneous version of Balahamsa as evidenced by the kritis of Tyagaraja and Sadasiva Rao has its roots in Govindacarya’s definition of Balahamsa with the arohana/avarohana being S R M P D s/s N D P M R M G S as an upanga janya under Harikambhoji mela. And also instead of rishabha, madhyama and dhaivatha are seen in profusion. The melodic difference between the Balahamsa as documented by Subbarama Dikshitar on one hand and that found in the version propounded by Govindacarya is best exemplified by the Mysuru Sadasiva Rao’s kriti. Attention is invited to the marked difference in the treatment of the raga in this composition. And it does make us wonder when this change to raga lakshana of this raga took place. Suffice to state that this raga is another member of that list which represent a difference in treatment as evidenced by the compositions of Tyagaraja on one hand & Dikshitar on the other. It’s interesting to note that the final avarta of the not-sung citta svara of the Guruguha vibhakti krithi ‘Guruguhad anyam’,starting with the phrase SRMPDPs is reproduced almost verbatim by Subbarama Dikshitar in his varna in the muktayi svara section. The conception of Subbarama Dikshitar of this raga is closely aligned to Muthusvami Dikshitar’s. The ragas Natanarayani and Mahuri have melodic overlap with Balahamsa. While Natanarayani goes as SRGSRMPDs/sDPMGRS and Mahuri goes as SRMGRMPDs/sNDPMGRS, despite the presence/absence of nishada, they would sound identical as they are all purvanga pradhana raga. They differ on the jiva svara – Rishabha is the jiva svara for Balahamsa and Madhyama for Mahuri. Muthusvami Dikshitar also employs additional motifs in Balahamsa such as the the drop from the madhya sadja to the mandhara pancama and a similar jump from the madhya pancama to the tara sadja. Similar such approach is seen in Natanarayani as well, such as dropping from madhya rishabha to mandhara dhaivatha, vide the Dikshitar composition ‘mahAganapate pAlayasumAm’ as notated in the SSP. The translation of the telugu lyrics of this rAgamAlikA can be read here. Vidushi Rama Ravi who traces her repertoire to her mother as well as to the scion of the Dhanammal family, Prof T Vishvanathan has also rendered this composition. This is part of a commercial release by Carnatica. And finally we have Prof S R Janakiraman rendering the rAgamalikA. In the sahitya of this composition Subbarama Dikshitar gives the lyric as “tirunElu srI kArtikEya divya mOhana shikivAhana”. It’s a puzzle as to which town/temple does ‘tirunElu’ imply! Does it refer to Tirunelveli? And if so which temple there, does it refer to and what is the nexus between that temple/kArtikEya and Bhaskara Setupati, to be so mentioned in this composition? Wish one knew the answers! Today Bhaskara Sethupathi is all but a distant & fading memory. The memorial he constructed to commemorate Svami Vivekanda’s return from America and his philanthropy may soon be completely forgotten. But Subbarama Dikshitar has immortalized him by these two compositions thus etching his memory forever on the fabric of our music. ‘sAmi entanI’ – Surati – Rupaka – Cauka Varna in praise of King/Prince Muddusvami Ettendra of Ettayapuram one of the several pieces that have been composed by Subbarama Dikshitar, quite naturally so as he was the Asthana Vidvan of the Ettayapuram Samasthanam. According to Prof Sambamoorthy ( ‘Kundrakkudi Krishna Iyer’ – An article in “The Hindu” dated 25-10-1970), the trio of musicians rendered the pallavi “Setupati Jaya Jaya Ravikula Raja Vijaya Raghunatha Sri Bhaskara Sami” in raga Bhairavi, Jhampa tala with atitagraha, at ¾ count with Maha Vaidyanatha Iyer as the senior performer. Raviraj: Thoroughly enjoyed your scholarly,extensive and exhaustive write-up. Excellently written. It is quite exhilarating to see the various events, currents and lineages interrelate. This is what true historical research is about. Thanks and congratulations. A lovely write-up. Extremely informative. It’s a pity that the majestic suraTi varNa of Subbarama Dikshitar almost never finds its way to the concert platform. 1. the meaning of tirunElu – It is srI-bhAskara-dhIrunelu – a plea to rAjarAjEswari that she protect(Elu) the gallant (dhIru) by the name of bhAskara. – Then again RKS has sung the same tillAna in a CD of SheSaNNa’s compositions. It has been published by SheSaNNa’s grandson Swaramurthy V.N.Rao, in his compilation of SheSaNNa’s songs. – Salem.D. Chellam IyengAr’s book of (pUchi)Ramanathapuram SrInivAsa IyengAr’s songs, gives the same tillAna, as RSI’s composition, listing the rAga as Sindhubhairavi. There is evidence of Sheshanna having performed at RamnAd, and he has in the Sankarabharanam tillana referred to srI-rAma-bhUpuni bAla sitA-rAma-bhUpAla; who is most likely one of the setupati-s. Thanks for the feedback. We hope to cover the Surati varna on similar lines as a part of an upcoming blogpost on the Ettayapuram Rajah. 1. Thanks for clarifying on the tirunelu/dhIrunelu sahitya ( Garavamu ganna) and its meaning. 2. The reference “srI-rAma-bhUpuni bAla sitA-rAma-bhUpAla” in the Veena Seshanna (1852-1926)’s Sankarabharana tillana must be to Maharaja Seetha Rama Bhupala a raja of the Gadwal samsthanam ( in modern day Andhrapradesh, famous for the Gadwal sarees). It was in this samasthanam that in 1919 Narada’s Sangita Makaranda was found.Incidentally he was also a patron of the Telugu poet duo of Tirupati Sastri and venkata Sastri. This is documented by Salva Krishnamurthi in his book. There was another Maharaja Ramabhupala of the samasthana of Atmakur during the period of 1888-1930.Not sure if he had a son named Seetha Rama Bhupala. So with the available facts I am inclined to believe that the Sankarabharana tillana refers to the Seetha Ramabhupala of Gadwal as the timelines too agree. It is certainly not on the Sethupathis. 3. As you mention, its recorded that Seshanna visited the Ramnad Court & Bhaskara had showered gifts on him. But we do not seem to have any reference to compositions if any he had created on Bhaskara. 4. On the Sindhubhairavi/Todi tillana- yes its indeed yet another perplexing question. As I mentioned in an earlier blogpost, we do have a version of the Pallavi Gopala Iyer Kambhoji varna “Intachalamu” with the poshaka mudra as “tulajendruni vara tanaya sarbhojendra”, while the standard version sports the ankita ” chamarenjundrini vara tanaya abhraraya chamdra”. Whose mischief it is we would never know for sure. And in the context of the Sindhubhairavi tillana ( One can speculate that the Todi morphed off to Desya Todi /Sindhubhairavi :-) ),there it is for us, recorded as having been composed on Panditurai tevar. Was it really not Poochi’s or was it an act of plagiarism, one would never know. Anyways for those of us who would be interested to hear the composition- here is one rendered by Semmangudi Srinivasa Iyer as he concludes a concert with this Sindhubhairavi piece. If you do have the Todi version please do upload assuming it has no copyright issues. It is a good article. Did you see the diary of Raja Bhaskara Sethupathi? The excerpts from that piece would have enlivened this article much more.